After one of its lawmakers was caught in camera while unveiling an indecent sign in J&K Legislative Assembly, another People’s Democratic Party (PDP) lawmaker created a buzz with his action. This time it was MLA Rajpora from south Kashmir’s Pulwama district, Syed Bashir Ahmad who slapped a marshal of the house. The incident happened on Wednesday when the assembly witnessed an ugly scene. PDP legislators raised a hue and cry in the assembly alleging that the state government was trying to protect the sexual assault accused former minister against whom an FIR has been lodged in Srinagar. And during discussion of the grants of Agriculture Ministry in the Assembly, Syed Bashir trooped into the well of the House over shortage of rations given to migrants. 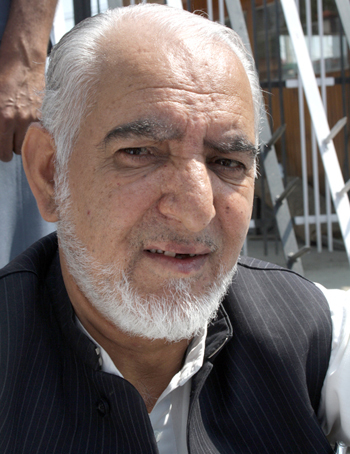 Speaker Mubarak Gul ordered Assembly marshals to remove him. As they were taking him out, other PDP MLAs also rushed into the well of the House, and the Speaker ordered their removal also. As the marshals were removing them, Bashir caught hold of the collar of a marshal and slapped him thrice. Soon Bharatiya Janata Party (BJP) chipped in by raising the issue of permanent settlement of refugees who have come to Jammu from Pakistan during the India-Pakistan wars of 1947 and 1965. Later, both the PDP and the BJP members walked out of the assembly, shouting slogans against the state government. Hailing from Sheikh Har village of Pulwama, Syed Bashir is a graduate and has remained associated with various social organisations. He won the 2002 Assembly elections and was made a Minister of State for Education. He later held the portfolio of Roads and Buildings. In 2008 Assembly elections, he got 10177 votes and was declared winner from Rajpora by a vote percentage of 25.12%. A day after during the Question Hour, Syed Bashir apologised to the House for slapping a watch and ward staff and maintained that he did not intend to insult or injure any Assembly staff.